For removing dirt and scale from inside piping. Compact size requires very little installation space. Simple construction makes maintenance easy. Double-layer screen catches even tiny particles of dirt. Large flow surface area results in minimal pressure drop, so there is no effect on equipment operation. 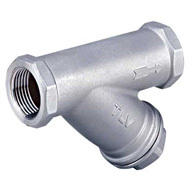 Protects steam traps and control valves, etc. by removing scale and foreign matter from inside the piping.